One of the benefits of press junkets like the one I just attended in Portugal is the opportunity to meet and chat with some of the people who actually create the cars being driven. Last week over dinner at Casa Māe in the port town of Lagos, I struck up a conversation with Wayne Burgess, who headed the I-PACE design team. Wayne is a student of Jaguar history. When I told him I was once the proud owner of a 1964 Series I XK-E coupe, his eyes lit up and he began an animated disquisition about how some of the design cues seen in the I-PACE hark back to the very same curves that made the XK-E such an international sensation. You can see in the side view how the new car has a subtle rise over the front wheels that dips slightly at the front door before rising to a distinctive bulge above the rear wheel. The curved glass in the tailgate itself pays homage to the rounded profile found at the rear of the E-Type. There is even a hint of the original XK-E tail lights at the rear of the I-PACE. It’s subtle, but it’s there. Aerodynamics are a critical piece of the electric car puzzle. Every molecule of air that has to be moved aside as the car moves along takes precious energy from the battery, energy that diminishes range. Aerodynamics were very much involved in the styling process that led to shape of the XK-E. Burgess told me that Malcolm Sayer, Jaguar’s design chief at the time, studied aircraft aerodynamics in his quest to lower the drag coefficient of the XK-E. Burgess and his team also applied the latest aeronautical design principles when shaping the bodywork of I-PACE. The key to low drag is keeping the air flow over the car as smooth as possible, and that means eliminating the swirling eddies that create turbulence. Unlike the cars from Tesla, the I-PACE has a prominent grille if for no other reason than to provide a place for the famous company logo. It was important that the car be instantly recognizable as a Jaguar. But Burgess and his team went above and beyond the typical grille. For the I-PACE, they created a rounded area at the top that folds back under the hood (or bonnet, if you prefer). Air from the front of the car flows up and over the grille and exits the hood through a large slot. It then flows seamlessly over the windscreen, across the top, and down under the rear spoiler and over the glass in the hatchback. The airflow scheme works so well, no wiper or washer for the rear window is needed. Stylists like rounded flanks and creases, but both create more drag. The sides of the I-PACE are vertical and are perfectly aligned with the wheels so both are in the same plane to minimize turbulence. Designers also like to pinch their cars in at the waist, something often referred to as the Coke bottle effect. Burgess and his team knew that narrowing the bodywork would increase drag, so they created an appliqué that mimics the look but keeps the sides nearly vertical. I must confess, when I first saw a photo of the I-PACE, I wondered why the hatchback was hinged so far forward. That design feature limits the car’s ability to haul bulky cargo. To my mind, an SUV is more like a Ford Explorer or a Chevy Tahoe — a vehicle that can swallow enough luggage, sports equipment, camping gear, and toys for a weekend at the lake with ease. But Burgess explained to me that the steep rake at the rear was necessary to get the aerodynamic performance he and his team were after. The I-PACE looks the way it does because that’s the way it has to look in order to have the 240-mile driving range the company wanted. During my time in Portugal (thank you Jaguar press team), most of the driving was on twisty mountain roads, but I also got some seat time on highways as well. Once you put aside all the hoopla about the car being electric, what is it like to actually live with the I-PACE and drive it like you would a conventional car? In a word, superb. The ride is supple yet well-controlled. The ride is quiet to begin with, but can be enhanced by the noise-cancelling feature built into the sound system. With it set to Calm, the cabin becomes a cocoon of near total silence as you waft your way down the road. But if the need arises to pass another vehicle, simply toe the accelerator and the car ahead soon winds up in the rearview mirror. No drama, no gnashing of gears in the transmission, no sound of a gasoline engine straining toward red line. Acceleration in this car is as simple as a thought. As soon as your brain says, “I’d like to be ahead of that guy,” it’s done. It’s as effortless as making the jump to hyperspace in the Millennium Falcon — the I-PACE has the ability to make ordinary cars quickly disappear from view. If I have any critiques of the car, I would ask for a little more room between the pedals. My cross trainer shod foot kept hitting the brake pedal accidentally, especially when I was out on the race track. The car has an enormous number of driver-selectable settings accessed via the central touch screen. From the point of view of someone getting into an unfamiliar car on unfamiliar roads in an unfamiliar country, I would prefer the ability to control all those settings via voice command. Needing to take your eyes off the road to adjust things is never a good idea. I give full marks to the optional heads-up display for precisely that reason. With it, the posted speed limit, vehicle speed, navigation instructions, and presence of no passing zones are all projected onto the base of the windscreen where they are clearly visible. I had never experienced an HUD system before. Once I got used to it, I decided I would never want to be without it. Don’t forget to tick that box on your I-PACE order form. During the press presentation at the Algarve racing circuit, the Jaguar people put up a slide showing the company’s entire model line-up. Under SUVs, it showed the E-PACE and the F-PACE. Then there was a space followed by the I-PACE. Hands shot up. Was that space an indication another electric SUV was in the works? Uh, no, came the response. Just a glitch over at the audio video team they said, before moving on quickly. 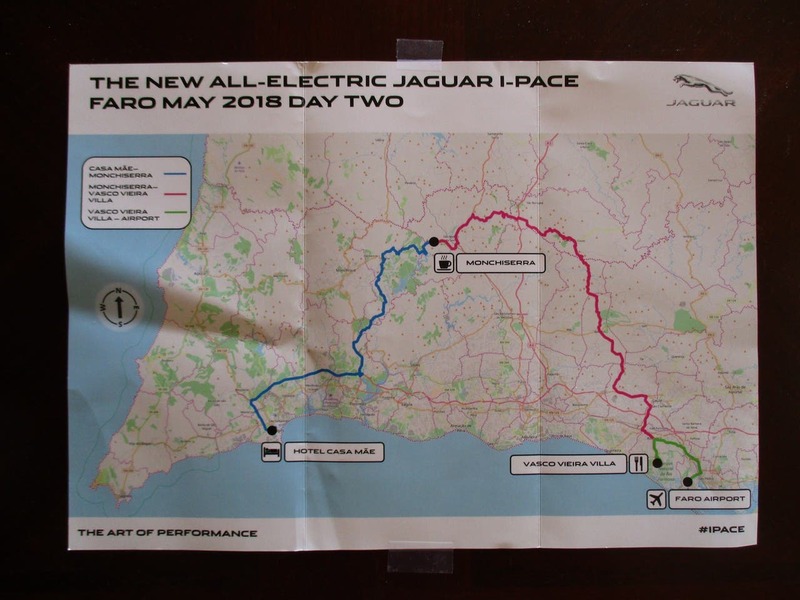 Nathan Hoyt, who led the Jaguar ride and drive event in Portugal, rode along with me for part of the journey on the second day. A more engaging fellow you are not likely to meet. He is devoted to all things Jaguar and obviously loves his job. Later, I contacted him to ask what Jaguar’s plans are for electrified cars in the future. After all, the company spent a lot of money developing the electric drive technology for the I-PACE. It would perfect sense to spread those costs over more units. 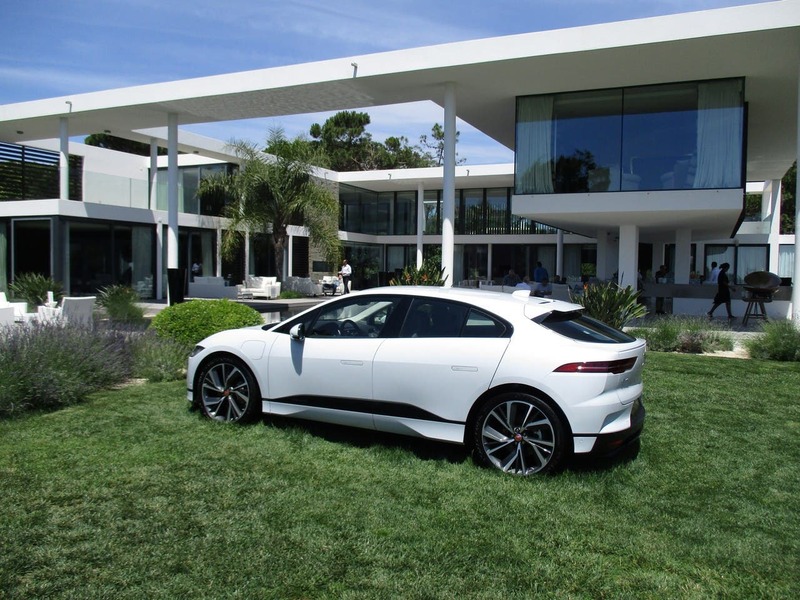 Last fall, it was widely reported that all Jaguars would be electrified by 2020. That report needs some clarification, which Nathan provided to me via e-mail on Sunday (journalists are not the only ones who work weekends, apparently). “This applies to all-new products introduced, not necessarily existing products or mid-cycle refreshes. While we will see changes to existing products — most immediately, the new 2019 Range Rover and Range Rover Sport models offering PHEV technology — the statement is more in regards to all-new models or significantly redesigned ones. I can hear some groans from disappointed CleanTechnica readers. We want more electric cars and we want them now! But we don’t have to meet payroll, pay suppliers, or satisfy shareholders. What Jaguar is saying is it is pedaling as fast as it can into the electric car future. Is it hedging its bets? Absolutely, as any prudently managed company should. Sales worldwide since Tata bought the company in 2008 are up nearly 250%. In the US market, they are up nearly 160%. Clearly, the company is doing something right. 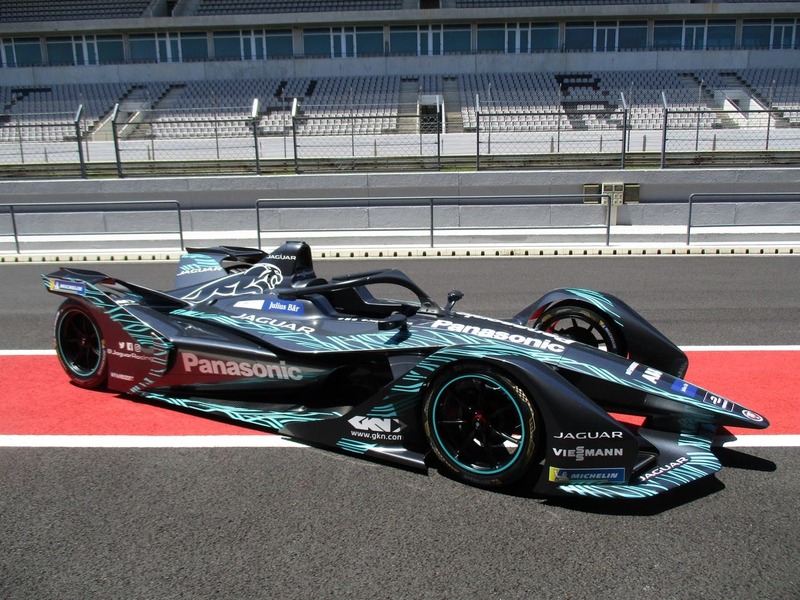 And it has made a major commitment to Formula E, the international racing series for electric race cars. While riding along with me in Portugal, Nathan Hoyt told me the owners in India have taken a very hands-off approach toward Jaguar. They assume the folks in England know what they are doing and try to stay out of the way. It seems to be working. Why mess with success? On the other hand, if the company sees its electrified offerings flying off its dealers’ lots, it has the flexibility to adapt and adjust as needed. Lots of traditional car companies find it hard to imagine EVs are going to really displace cars with internal combustion engines. But if the market demands them, build them they will. After all, Deutsche Post started out to build electric delivery vans for its own personal use. Then others heard about them and wanted some for themselves. Deutsche Post has now opened a second factory to meet the demand. Suddenly, it has become an auto manufacturer in its own right. 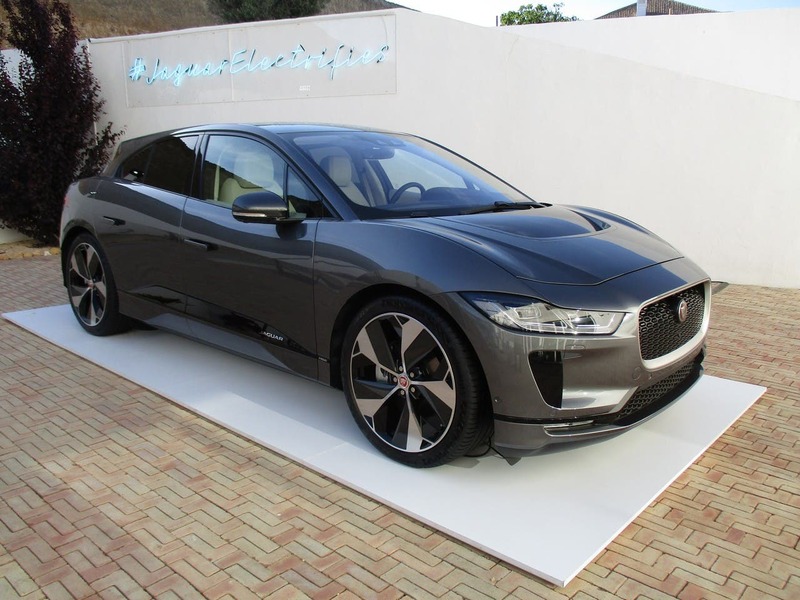 Perhaps Jaguar will be pleasantly surprised to find it has more customers for electric cars than it planned on. What a welcome surprise that would be. Infinity pool at Casa Mae in Lagos, Portugal. Those Jaguar people sure know how to pick great spots for journalists to kick back and talk about their cars.